It took the discipline of Twitter and the tyranny of the 140 character rule to force me to cut stories to the bone. I have attempted to do so without utilizing much in the way of abbreviations, so common to Twitter but that make some tweets difficult to read and resembling a foreign tongue to those unfamiliar with it. Where possible I experimented with omitting punctuation, like quotation marks and non-essential commas. I suspect that social media is, indeed, influencing English usage greatly in this regard––I see evidence of it everyday in my students’ writing. With the space I am allowed, I have tried to achieve what Brautigan did so elegantly in his work over 30 years ago: build conflict, create character presence, offer catharsis and surprise––and I hope capture for those of us living today a sense of what it is like to live in the 21st Century. 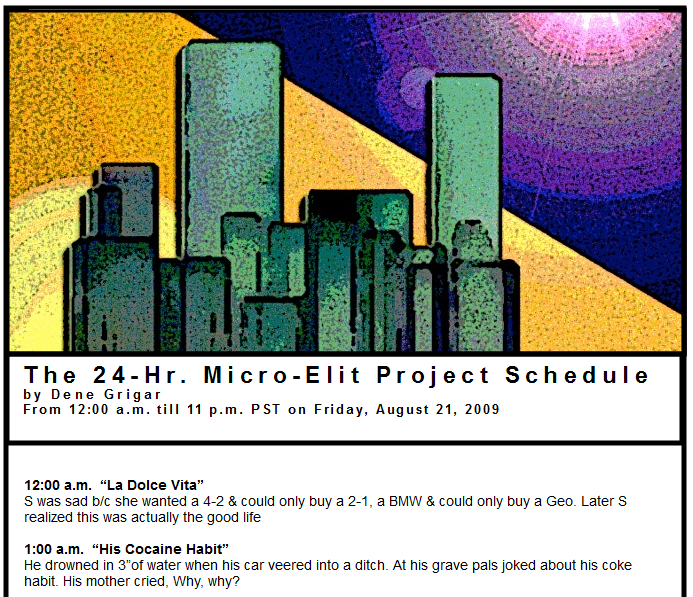 The website for the project currently displays the 24 micronarratives in its Scheduled Works page, organized by hour. And they are a joy to read, exhibiting great control over timing— not of their scheduled publication in Twitter— but of how a sequence of sentences, phrases, words can use their temporal linearity to deliver surprises, even punchlines. These short narratives remind us what poets and comedians know well from composing lines, that language is a time based medium in which words, their sounds and meanings, are layered before a human consciousness. The compression of this constraint-based writing project succeeds because it treats its cognitive units as elements in a chain reaction, producing the desired effect through carefully designed sequential delivery. There was a social dimension to this project in which the audience and participants in Twitter used the #24hr hashtag to identify their entries, all of which are included in the site’s blog. The links are currently unavailable, but the few that are readable exhibit a spontaneous energy of fresh inspirations, which create a counterpoint to Grigar’s carefully, tactically written vignettes. Twitter reminded us of the power of concision in language, urging us to “be more clever” whenever we failed to meet its 140 character limit. Grigar’s micronarratives and overall project show us that our tweets need not capture a moment’s thought: they can be tactical in their delivery, and can be as pithy as any poem.